Any show that begins in full blackout long enough for the elderly patron next to me to start murmuring and glancing at the program with the light of his phone screen is one that is going to pique my interest. Evening – 1910, a new musical written by Randy Sharp and Paul Carbonara (a former guitarist and music director for Blondie), has many interest-piquing factors. Indeed, it began in the pitch dark. 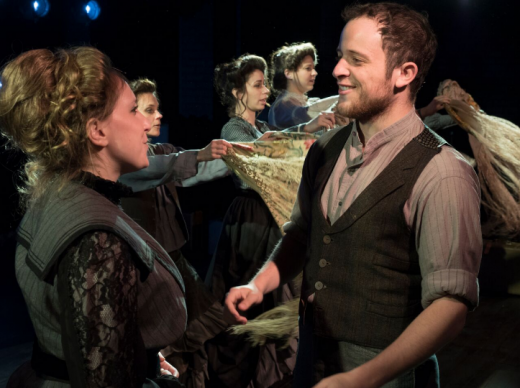 It’s an entirely sung-through musical in a quaint and intimate space (the Axis Theater in the West Village) with a live band. It follows immigrants who arrive in the city in 1910. Some are showgirls at a failing variety show theater on the Bowery who dream of finding more fulfilling work, one is a man who enjoys using his camera. Their lives are interrupted by a rich man who intends to transform the theater into a cinema. I went in expecting a story with recognizable streets and neighborhoods, where I would get to know the characters and go on a journey, emerging more worldly about the past lives this city once had. Instead, it was difficult to follow. This could be initially attributed to the characters’s own lack of expertise regarding their surroundings. In one of the beginning songs they all sing: “Aren’t the streets in a grid? / But this one didn’t stay straight / And this one bends / And this one just seems to end,” which recalls any fresh New Yorker’s confusion when they realize the streets they’re walking suddenly no longer have numbers. However, just because the characters were confused doesn’t mean the storytelling should also be. It wasn’t very clear exactly how anyone felt about the rich man’s plan to revamp the vaudevillian stage for showgirls into a cinema, aside from the beaming rich man himself. The cinema’s presence was not a large one, save for an especially beautiful final stage picture involving what seemed like a dozen hand-operated projectors illuminating each cast member’s face. Typically tales of the rich coming in to replace relics with the shiny and new (especially stories involving New York City) present a clear case for one or the other, but this felt distracted exploring other story routes. One of the storylines that made itself clear enough despite the (literally) dim light was a love story between Henry, the man with the camera (Michael Sheehy), and one of the showgirls (Shira Averbuch). They meet in the street, leading to a slowly and sweetly blossoming romance. However, their destiny is cut short when the rich man (James Scheider)’s sister Evelyn (Emily Kratter) also has her eyes on this cameraman. Money triumphs over love, and Henry chooses Evelyn, albeit begrudgingly. Sad as this is, it also results in one of the show’s finest and most emotionally poignant songs, sung solo by Averbuch, chronicling an instance of waiting (and waiting, and waiting) for Henry to show up and meet her. These days, the pain of being stood up can end early with a quick text or phone call. Not so much in 1910. Another interesting plot point revolves around the aforementioned infatuated showgirl dreaming of leaving the dusty variety show where she performs tired routines for tired people, so she can instead begin work as a factory girl. 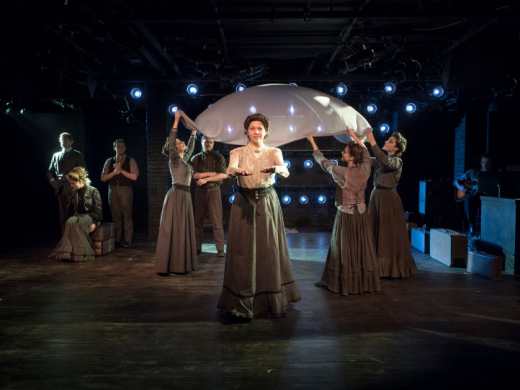 She has a whole song about what she gleefully imagines factory life to be, stopping her dreaming only when someone tells her that the life of a garment worker isn’t as kind as she thinks (Carbonara and Sharp also penned a musical about the Triangle Shirtwaist Factory fires). We briefly see the women at work in the factory after this, but the potential for this storyline, for how these women will find their new fate, isn’t quite explored beyond that. Some of the show’s narrative thinness can be chalked up to its quick, 75-minute run time, which tried to deal with quite a lot in not a lot of time. Others, its lack of dialogue. The music was unmistakably beautiful, full of rich harmonies and sweeping chords, but oftentimes it adhered to the repetitive structure of pop or rock music more than it worked to push the narrative forward. The staging had most characters present the entire time, performing subtle choreography based off of everyday gestures when they weren’t singing, but this sometimes distracted more than entertained. 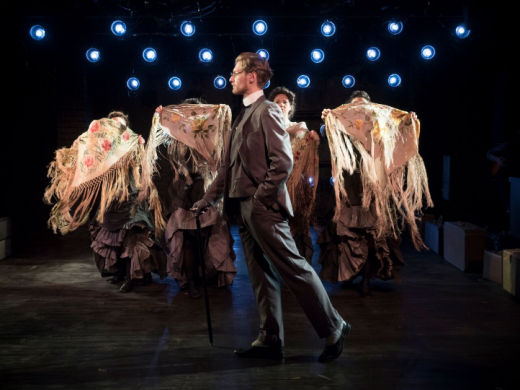 Evening – 1910 continues through May 28 at Axis Theater, One Sheridan Square, Greenwich Village. Tickets are $40 ($30 students/seniors). More info here.